Hey there! Thanks for dropping by Jared in Japan! Take a look around and grab the RSS feed to stay updated. See you around! Nintendo DS is one of the most popular hand-held systems in Japan and with its popularity comes a variety of different games. With so many games, it’s impossible for all of them to make it into the United States. One game that never made it to U.S. shores is Itadaki Street, which literally translates to Top Street. Itadaki Street is a computer board game created by Square-Enix. 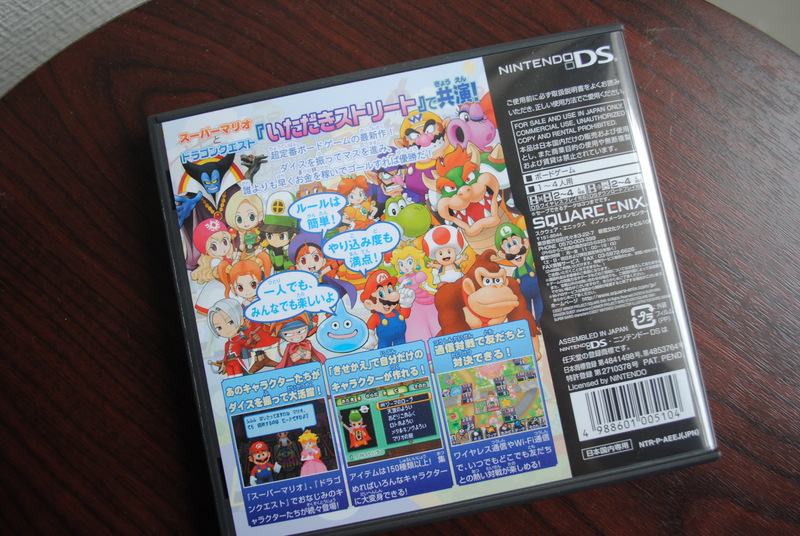 The version I played specifically for this review was created for the Nintendo DS and featured a crossover of Super Mario and Dragon Quest characters. A game of Itadaki Street plays out similarly to a game of Monopoly. Players start with 1,200 gold and travel around the game board purchasing properties. As properties are acquired the street (which is a collection of 4 color coded properties) goes up in value. That is where the similarities between Itadaki Street and Monopoly get a bit skewed. 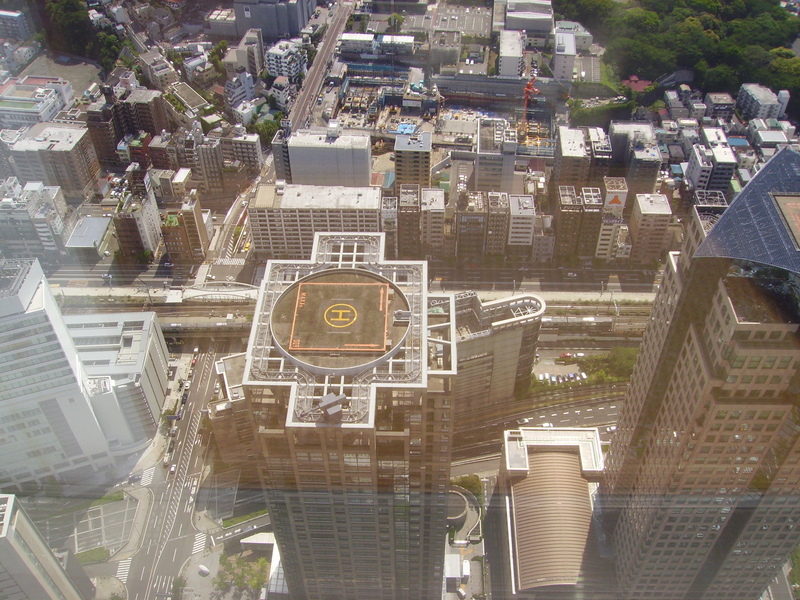 Since Itadaki Street is a digital board game the arrangement of the game board and number of streets are not always the same; there are however many squares that must be in each board. These squares are the bank, casino, inn, lucky square, and chance card squares. The bank is comparable to the Go space on a Monopoly board; it’s the square where players start at the beginning of the game and it’s where the stock trade transactions take place. 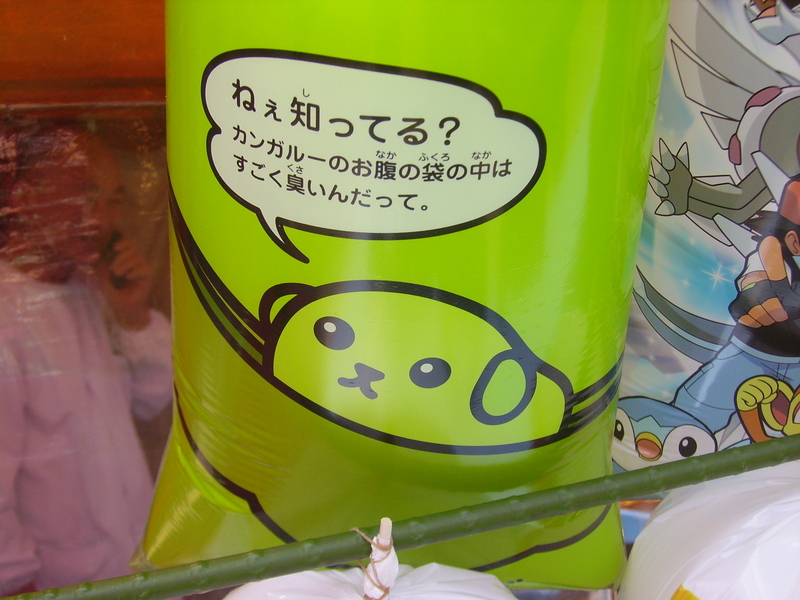 Players buy stocks to increase their overall net worth which is an important factor in winning a game of Itadaki Street. Stocks also give players a small cut of any transactions happening on the streets they have stocks in. The bank is also where players earn bonus money upon gaining a level which is achieved via the aforementioned chance card squares. Chance cards are a total of one-hundred different cards that have various effects on the game, such as decreasing a street’s stock value or stealing a property from another player. There are a total of five chance card squares on each board; one is a miscellaneous chance square represented by a question mark which allows the player to pick a chance card upon landing on it. The other four chance squares take their shapes from a deck of playing cards, and also allow a player to pick a chance card. However when a player passes one of the shaped squares that shape is added to their collection. Once all four shapes are collected players can go back to the bank and level up, which rewards them with a cash bonus similar to passing the Go space in Monopoly. The inn square causes players to fall asleep which takes rent cost down to zero for that player’s properties for one turn, the casino square pits players in a random game of chance for high profits, and the lucky square gives whatever player that lands on it a cut of all of their opponents monetary transactions. Players can buy houses on their properties like in Monopoly; however a player doesn’t need to own every property of a particular street to buy one. All a player has to do is land on any property square they own and they can put money towards a house on one property of their choice. Just like Monopoly the more money you put towards the houses, the more it will cost players who land there. An interesting action players can perform is something I’ve come to call a hostile take-over; to perform this action players must land on a property square owned by an opposing player. After paying the rent players have the option of taking control of that property square but at a high cost. There are two ways to win a game of Itadaki Street, one way is to bankrupt all other players on the board, the other is reaching the board’s preset winning net worth total which varies based on which board is being played. Graphically, Itadaki Street DS is a beautiful looking game based on Nintendo DS’s standards. The game has a great variety of characters that animate fluidly and there is a variety of stylized backgrounds for each game board. Itadaki Street’s audio leaves little to complain about with much of the game’s music paying homage to both intellectual properties. 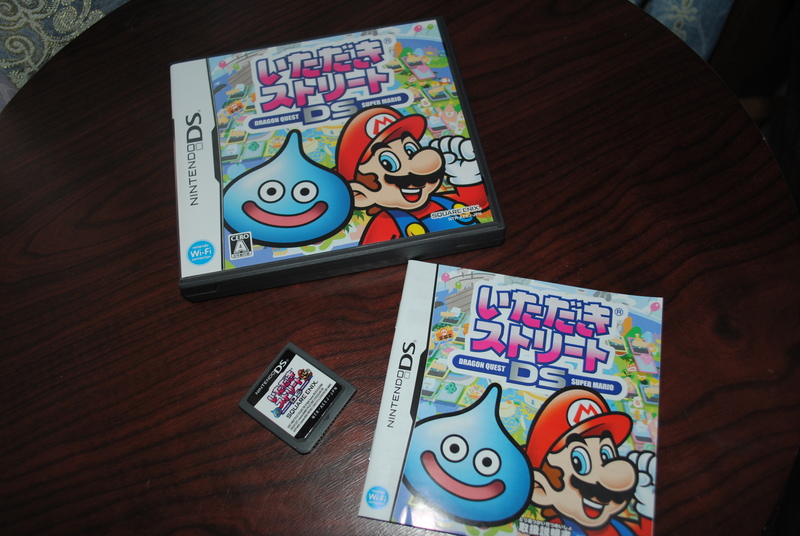 Fans of both Dragon Quest and Super Mario might be a bit disappointed to know however that they do not take control of any of the characters from either series. Instead, players must create a character that can be dressed in custom attire should they have the gold required. There are many aspects of Itadaki Street I find enjoyable. First the stock market system, it adds a surprisingly fun twist to an otherwise straight forward system. It’s a good feeling knowing your stocks have paid off when you start getting huge cuts of each monetary transaction. Also being a huge fan of Super Mario, it’s nice to see my favorite characters along with hearing some nostalgic tunes from the series. Even though I can’t play as my favorite characters the game does throw me an olive branch by allowing me to buy items to customize my character. However there are some problems with Itadaki Street as well. Like Monopoly, although there are some strategies, most of the game is factored on lucky rolls. Players only roll one die and it’s not uncommon to have several turns without landing on a vacant property square which can be infuriating. Game times can take several hours forcing players to put in ample free time to complete one board. It’s also an extremely hard game; even the lower ranking opponents can be extremely ruthless. Personally I like Itadaki Street but in the end it’s a very niche experience. This is game that is built for two types of enthusiast. In the one hand are the hard-core fans of either the Dragon Warrior or Super Mario series. In the other are the die-hard Monopoly fans who don’t mind the added complexity of a stock market and changing game boards. Anyone not in these two categories should steer clear of Itadaki Street DS because it’s not the game for you. Our class paid a visit to Asakusa Temple during one of its many festivals. There were people everywhere for the celebration we could barely get into the main gate. Speaking of the main gate the lantern that hangs from it was folded up that day which Japanese locals informed us was a rare sight to see. Once inside there were shops everywhere that sold various assortments of food, weapons, toys and souvenirs. The shops were quite beautiful and I want to know where in America I can get a katana as cheap or as gorgeous as some of the swords at these stores. I really wanted to see the temple so I continued to battle my way through the crowds. 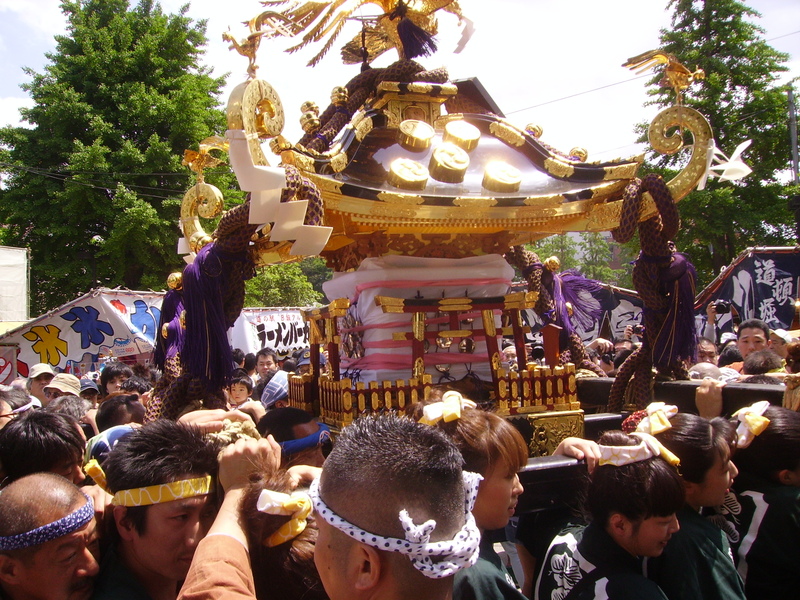 While on my way I noticed loud chanting and cheering as a group of Shinto volunteers carried a relic throughout the temple grounds. Before entering the temple I stopped for a second to check my fortune. For 100 yen a person can shake a silver colored canister and remove a stick. Engraved on this stick is a number which tells you which drawer holds your fortune. The fortunes range from best, to great, regular, and even bad. Never fear if you get a bad fortune though there are spots all throughout the temple where you can tie-off and forget your bad fortune. The temple itself was amazing; it was dimly lit by candlelight and filled with statues and beautiful artwork that I can’t even begin to understand the meaning of. I think that’s why I enjoyed our temple visits the most, the mystery surrounding all the artifacts and relics inside their walls. Daisho-in is a Buddhist temple on the foot of Mount Misan and was one of our cultural visits on our day in Miyajima. It was without a doubt one of the most breathtaking temples I’ve ever seen. At the temple’s base there was a stairway that had rotatable railings with important teachings engraved on them. At mid-climb was a donation box, the kicker was that there was also a bell, so anyone who donated money could proudly ring the bell to announce their presence. Before entering any shrine visitors were required to take their shoes off at the base of each staircase. At the top of most shrines was a pedestal where sweet smelling incense burned. Bringing the smoke towards your face and breathing it in is believed to be a cleansing and blessing of one’s body. One of the many shines we entered was a dark underground hallway which I believed was representing the darkness of life. However before you exit the shrine you’ll see lighted Buddha panels symbolizing the enlightenment of his teachings. The best part of all about Daisho-in Temple is the many miniature carved statues of Buddha. 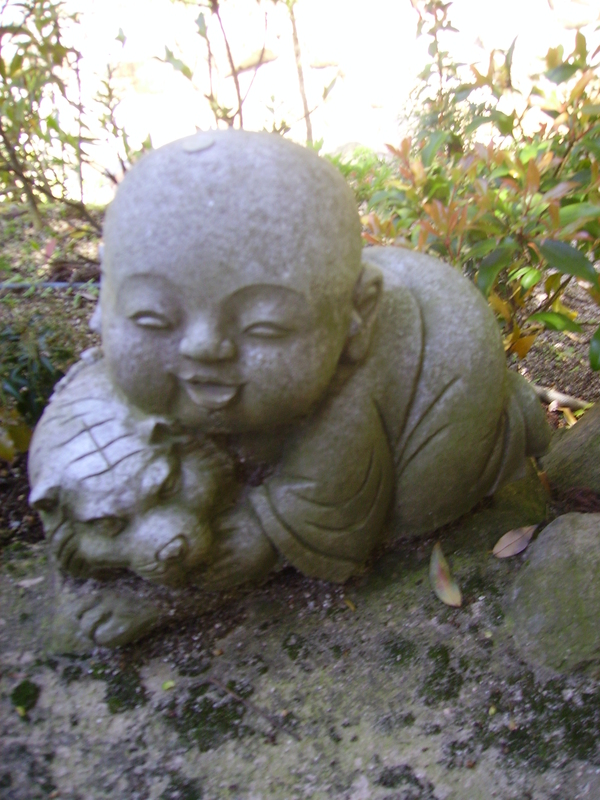 There is a giant path of these statues and most have been decorated with small donations of yen. Some are serious, some are cute, but all of them show devotion and loyalty to Buddha and his teachings. One of the greatest places we’ve visited in our time in Japan would be Miyajima Island, it was truly and otherworldly experience. From the moment our group exited the dock we were observers to many new wonders. Our First sight was the deer of Miyajima; they were about as tall as a medium sized dog and smelled terrible. The interesting thing about these deer is that they had no fear of humans; they casually walk up to you and wait patiently for you to feed them. Okay, so it wasn’t always patient. Some will try to eat the map you may be carrying out of your hands or backpack; others will buck you if they feel you’re holding out on them. 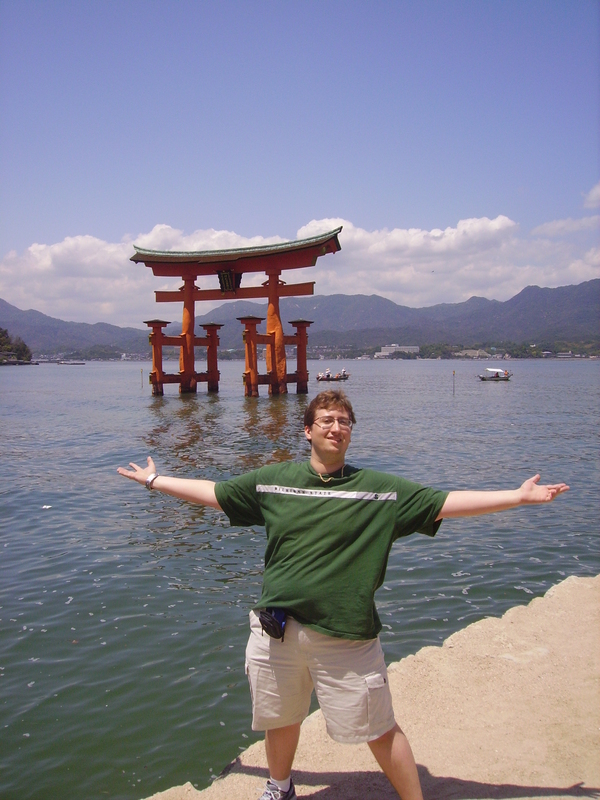 Second was the Itsukushima Shrine or the floating gate as some people call it. Let me tell you that pictures don’t do this site justice. Travelers are blessed with a beautifully open seaside view to snap photos for memories or just reflect on how awesome it is to get out and see the world. Even though the floating gate is somewhat of a tourist attraction observers can take notice that there are still individuals who view the gate as a sacred place. I could see pilgrims in row boats paddling their way through the gate to receive its blessing. The best thing about Miyajima is how ancient the villages look. It feels like a place untouched by time and there are buildings that I’d swear could be centuries old. All in all that’s the main reason I enjoyed Miyajima, there is a certain peace one obtains from the old-time simplicity. Clean Streets and No Garbage Cans? Japan is one of the cleanest places that I’ve ever seen. In the three weeks I’ve been in this country I’ve only counted about eight pieces of trash on the street. It sounds a bit hard to believe but it’s one hundred percent true the streets here are just that clean. Now here’s an even bigger brain teaser, there are barely any garbage cans anywhere in Japan. Oh you may find one or two in the train station or near a vending machine, but don’t expect to find one on the streets, your chances are slim to nil. I personally like it though, the lack of garbage cans helps to keep me traveling light because I don’t know how long I’ll have to walk with an empty soda can in my hands or wrappers from whatever candy I’ve purchased. Also with how clean the streets are I can’t even find the urge within myself to litter, I just don’t want to ruin I good thing. Now if only we could figure out how to psychologically stop people from littering so America could have cleaner streets. In Akihabara it is not uncommon to see Japanese women dressed as French maids handing out fliers on the streets. 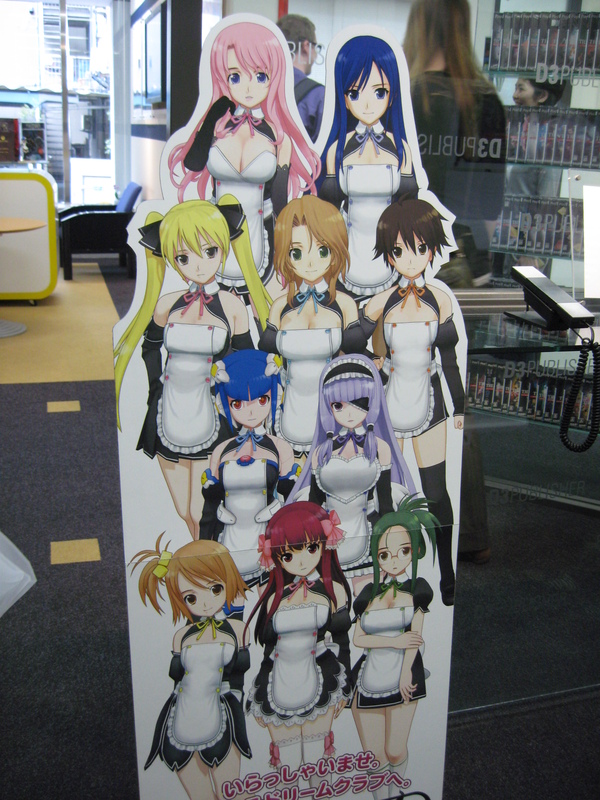 What are these fliers advertising you ask why a maid café of course; but what is a maid café? Our class traveled to Akihabara and successfully figured out the answer to this question. A maid café is a cosplay restaurant serviced completely by women dressed as French maids. Upon entering the maid café our ears were graced with the sound of happy euro-beat style electronic music with high pitched cheery singing in the background. The music was adorable and made it hard not to smile while we waited for what happened next. Waitresses brought us our menus and patiently waited while we attempted to translate it. The interesting thing about the maid café is how the food is served to you. Maids bring out the items one at a time and for each item you have to perform the maid café cheer. You do this by holding your hands in the shape of a heart and repeating after the waitress. It was very cute but a bit of a strange way for adults to act and probably the slowest way to serve a meal. One of our classmates ordered the special lovers spaghetti plate which interrupted the order of the café. Our class was called up to take a picture with the entire troop of maids. Overall it was a fun, if a bit awkward time. The Japanese Tea Ceremony is a practice that dates back to the ninth century when tea was first brought to Japan. 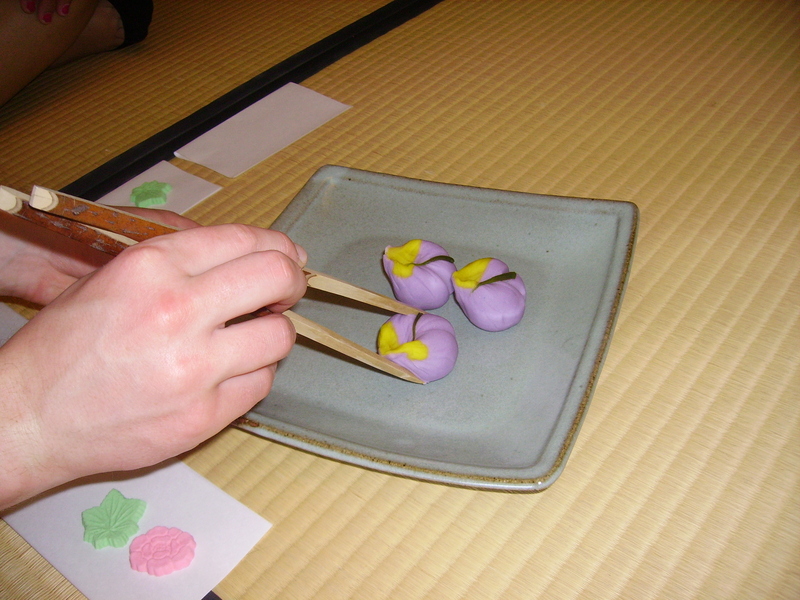 On our travels in Japan our class was able to take part in one of these Japanese traditions. We were brought to a room on the 65th floor of a very nice hotel in Tokyo, where the tea ceremony was to take place. The tea room was beautifully decorated in traditional Japanese fashion; large stones formed a path across a room filled with wet tiny white rocks. Removal of our shoes was a requirement before we could venture inside towards the straw floor where the ceremony was to take place. The straw floor was refreshingly cool a great contrast to the humid summer day happening outside. Before we began the hostess informed us that the straw mats were cool in the summer and warm in the winter that’s what made them the official floors of the ceremony, neat! The hostess then handed out sweets that were represented by shapes of the season and truthfully they were a bit too sweet for my tastes. We learned that the reason sweets are handed out in the tea ceremony is to combat the bitterness of the green tea. Every movement the hostess made in the preparation of our tea was carefully a recreation of her ancestors of old from pouring the water from the hot boiler to the way she stirred it with the straw brush. When the tea was presented to me I bowed as was told to show my appreciation. In my opinion the tea didn’t need any sweets to counteract it, the tea was probably some of the best I’ve drank in my life. It was around 7:30 P.M. and a group of my classmates as well as myself were waiting patiently for our professor to meet us in the lobby of our Osaka hotel. We were about to make a 65-80 dollar investment on one of Japan’s most famous meals, Kobe Beef. Actually to call Kobe a meal is an insult; it was a delicacy of flavors that danced around enticing the pallet. Walking into the diner I didn’t think much of the place, it was small and shared resemblance to the greasy spoon diners back home. As we sat down at the bar like counter there were only two options placed in front of us, a small set for 6500 yen or a medium set for 8000 yen. Anybody who didn’t know what they were into would’ve left that diner faster than they entered. We finally finished ordering our sets and that’s when the fun began. The chefs at this place must have studied a long time because every action performed was synchronized. The steak was placed methodically on the skillet which was then garnished with onions and steak fries and the wine turned up the heat turning the dish into a pillar of flame. 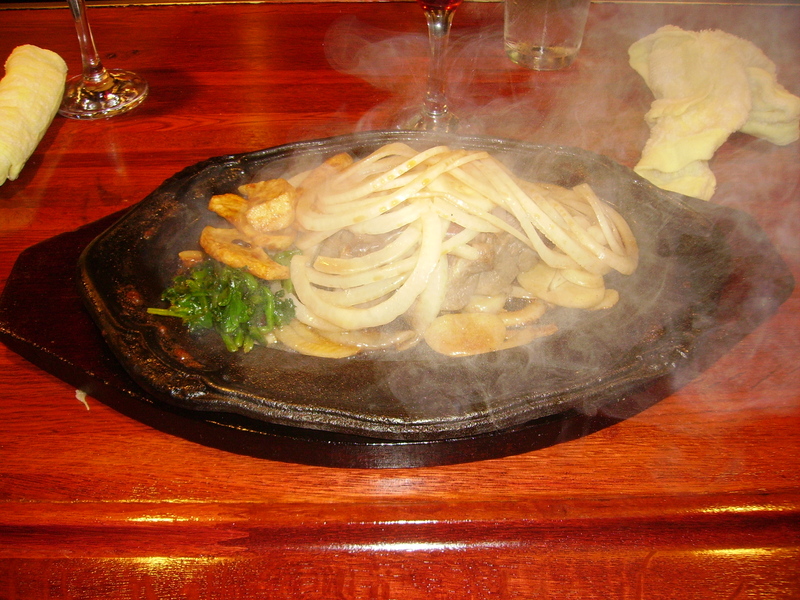 Skillets were removed from the heat source still aflame and put out with a few light flips from the chef. All of our steaks were placed in front of us still sizzling with an aroma indescribable by words. All you needed was a chopstick to cut the steak it was a tender juicy masterpiece. Kobe Beef is a must experience for anyone in Japan no excuses, if you come here you must get some. How About Some Service Here! When it comes to food service Japan is one of the best countries. Servers are always polite, clean, attentive and fast. The cherry on top for this countries’ food service industry is when it comes to the issue of tipping. It is considered rude to tip your waiter or waitress so therefore, you never have to leave a tip, prices on the menu are the prices you pay! There are even restaurants where the server is cut out entirely and replaced with a ticket selling vending machine. Patrons only need to deposit their money and choose from the nicely pictured menu. This system is great because it allows you to order at your own pace. If you’re in a hurry just pay and hit the takeout button, if you’re just on a casual stroll hit the dine-in button. The kitchen staff is incredibly fast at these vending diners, patrons usually receive their food within 3-5 minutes of their order. This may seem like magic but after my friend Pochin and I gave a closer listen we heard whatever we ordered announced over a loud speaker in the back. This is what prompted the chef to start cooking before we even sat down and handed him our tickets. Overall I feel the food service in Japan trumps that in America because the service is better and I don’t have to leave a tip to ensure it stays that way. Bathroom breaks are a fact of life. No matter what culture you’re from or how you feel about the world, when nature calls we all think along the same line. 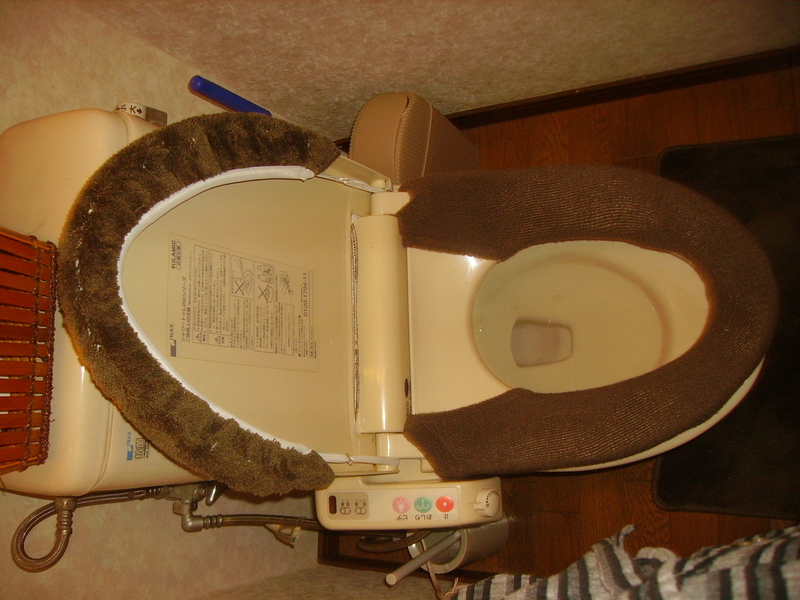 In Japan one can find toilets similar to the thrones back in the United States. However there are also toilets with extreme upgrades over our well known American toilet, as well as extreme downgrades. Most toilets in Japan have heated seats the help protect users from cold shock syndrome upon placement of their posteriors. There are some toilets that have automatic lid lifters that tend to scare unsuspecting users. I almost broke the door of the bathroom I was using the first time I was put in front of an automatic seat lifter. The final feature of the upgraded toilet is the washing features it offers. If one is inclined to use it all that needs to be done is the press of a button and the toilet will help clean you out. With all the features of washing toilets it’s hard to know why squatting toilets can still commonly be found in Japanese restrooms. Move over America, it doesn’t look like baseball is your favorite pastime anymore. You haven’t witnessed a live baseball game until you’ve seen one here in Japan. First thing to note some of the nicest security you’ll see anywhere. Yes, the guards at the gates will search you bags but they’re not pushy or irritating about it like the security back home. Second, if you’re entering the arena with a drink from the outside of any kind the associates will graciously pour it into a nice plastic cup for you and thank you for buying tickets to the game. Third, the prices inside the stadium are actually fair, still more expensive than outside goods but not to the level where complaints can be deemed necessary. Finally the crowd, absolutely everyone at the stadium is excited to be there, and the home team receives non-stop praises and chants from their loyal fans. The fans may be loud but they’re fun and extremely nice. There was a super fan sitting in front of us who taught us some of the cheers rather than laughing at our ill fated attempts. 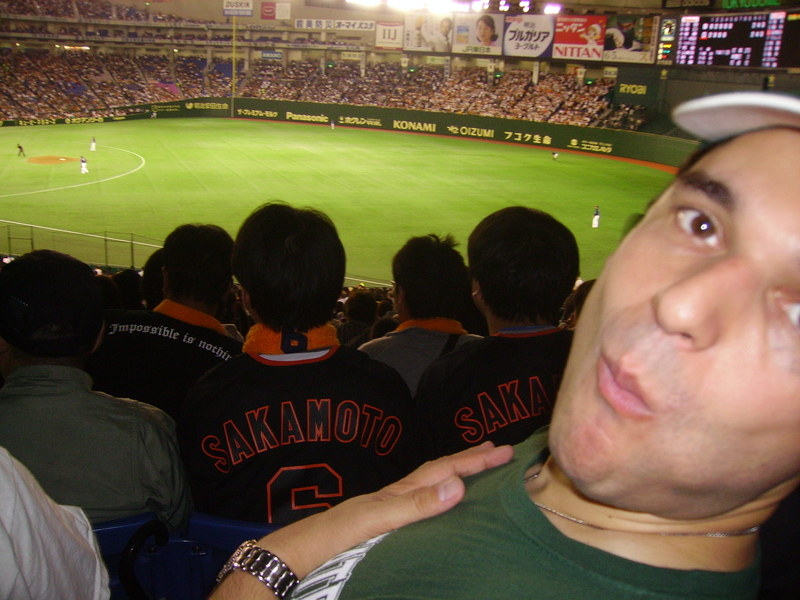 I don’t think I can experience a baseball game in America quite like the one I was a part of here in Japan. 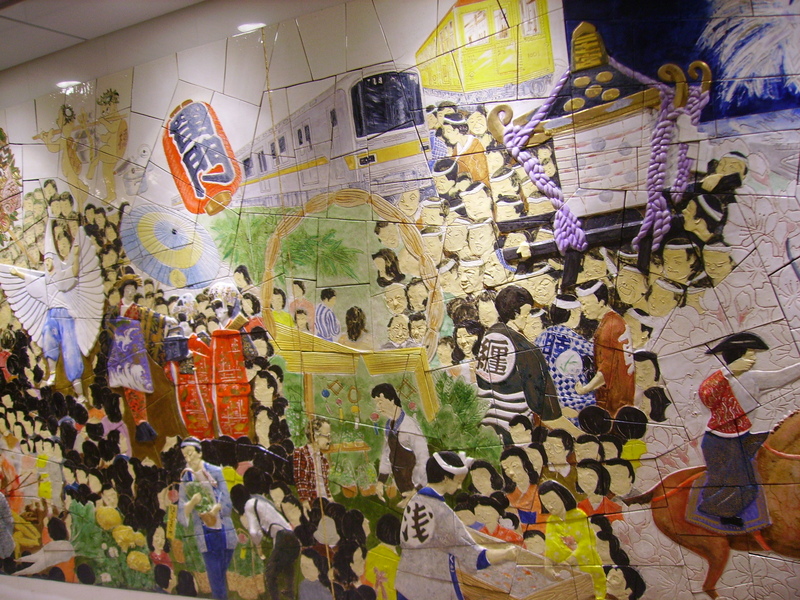 The subway system in Japan is an essential part of life for most Japanese people. Since most locals don’t have drivers licenses a subway provides them with a cheap and efficient alternative. Entry into the subway system can be achieved many different ways. Casual users can use the ticket master to buy a pre-paid entry ticket which gets recycled into toilet paper after the transactions are complete. Heavy users can purchase a subway card. In Tokyo there are two major cards Pasmo and Suica. 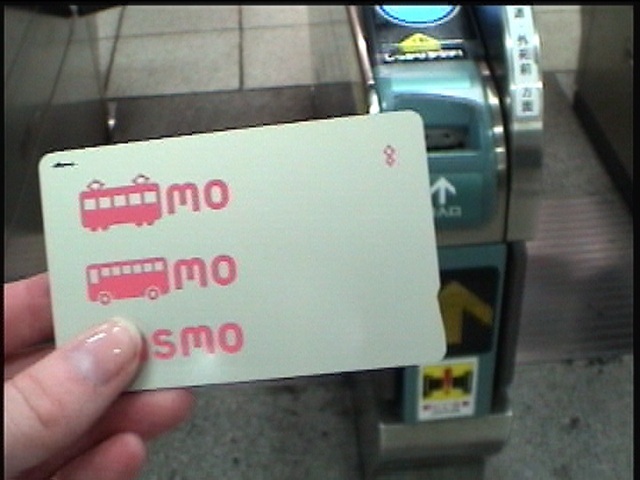 Pasmo is more of a direct subway card handled by the Tokyo subway companies where Suica is the card put out by Japanese rail company JREast. Once you’re in possession of a subway card, you can charge it at any ticket station and use it as much as you want. Pasmo and Suica are not only earth friendly, they’re also multifunctional. Patrons can use their cards to purchase goods from vending machines and from stores inside and sometimes even outside the subway tunnels. With all the uses for a subway card the Japanese have something better than a license that is also more eco-friendly. I’m writing this post from one of the coolest places I’ve ever seen in Japan, a place named ManBoo, a “manga kisa” or internet cafe. This place is basically like a high-tech Japanese youth hostile, for 15 dollars or 1480 yen a night you are given access to a private booth. 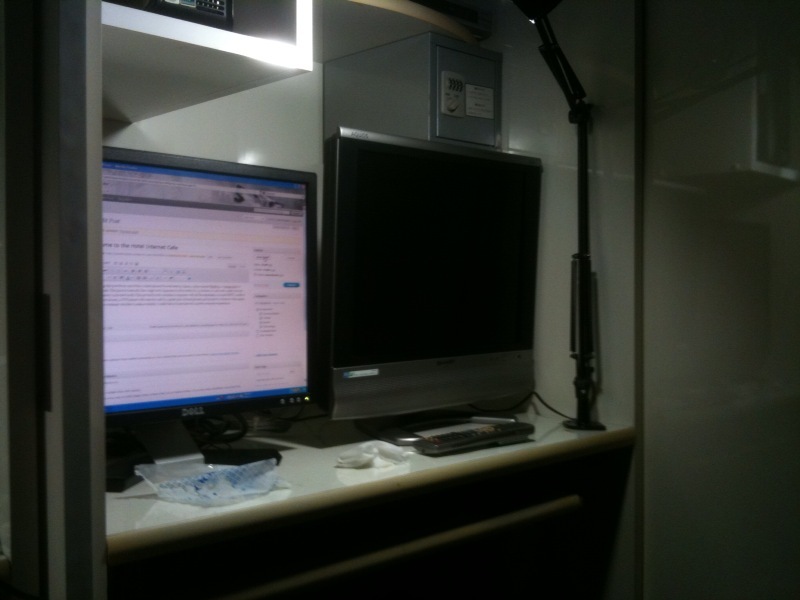 This private booth contains a computer with all the essentials, a 21 inch HDTV, a safe to secure your money, a DVD player with remote control, a great pair of head phones, and access to whatever video game system the company decides to make available. The private booth isn’t the only thing you get for the price, users of the manga kisa are also given access to all the drinks and ice cream they can possibly stomach in the time provided. There is also hot food available but that does cost a bit extra, can’t have it all I guess. Oh and did I forget to mention the fact that the private booth comes with a beanbag chair and that the booth itself is a padded leather seat that’s comfortable enough to sleep on. Overall the manga kisas are an extremely comfortable places to stay at extremely affordable prices, eat your heart out youth hostiles. In the United States if one desires to be self-reliant they need a driver’s license if they hope to go anywhere. There are not many places in the U.S. where other forms of transportation are available or affordable. That’s why coming to Japan is a bit of a culture shock because it’s basically turning this mentality on its head. 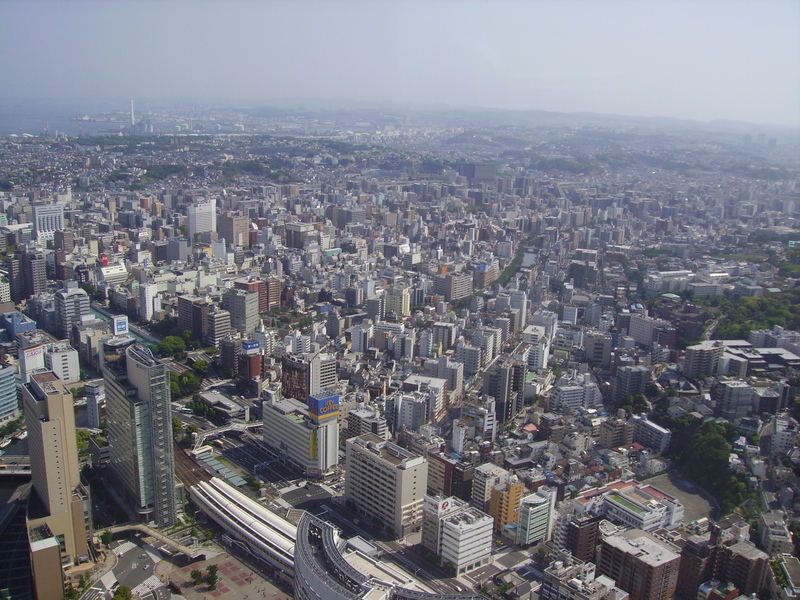 There are many different forms of public transportation available in Japan, and it is more common for a person to use a subway to get from point A to B rather than a car. As an American, the idea of not having a driver’s license is extremely odd because back home it’s hard for someone to be successful without one, although there are those rare cases. In Japan I wouldn’t be surprised to find out that most individuals probably don’t have a license due to how expensive it is to own a car here in Japan and how cheap it is to ride the subway, take a train, or charter a bus. While walking around Japan you’ll find vending machines absolutely everywhere. These vending machines sell a variety of goods from hot and cold drinks, ice cream, noodle cans, meal tickets, and even French fries. Really almost anything you can imagine could very well be sold in the vending machines in Japan. Besides being a marvel of variety, Japanese vending machines are also a marvel of technology. In America if you want a hot or cold drink you have to find a specialized machine for one or the other. In Japan both drink types can be offered from a single machine. If you’re in a hurry some machines allow you to buy products with your subway card which is a great way to extend its usability. I can’t help but be amazed at how well maintained the vending machines are here even the ones hidden in back alleys. No matter where you find a vending machine in Japan it’s always clean, well stocked, and one-hundred percent functional. Here in Japan there are convenience stores everywhere, all along the streets one sees multiple signs for AM/PM, Lawson, 7/11 and the like. In the US, a trip to the convenience store usually implies a late night snack, or a beer and tobacco purchase. In Japan one can get these items and I dare say that convenience stores in Japan offer so much more. They are comparable to mini super markets in America, and as such it is where most Japanese people go when they need supplies for whatever reason. Food, toiletries, health and beauty products; all of these items can be found within the shelves of a “konbini”. Due to their popularity, they are able to offer better prices and more options than those of their American counterparts. Besides the usual candy and soda aisles we find in America, a Japanese convenience store is stocked with pre-prepared meals that come in little boxes known as bento. 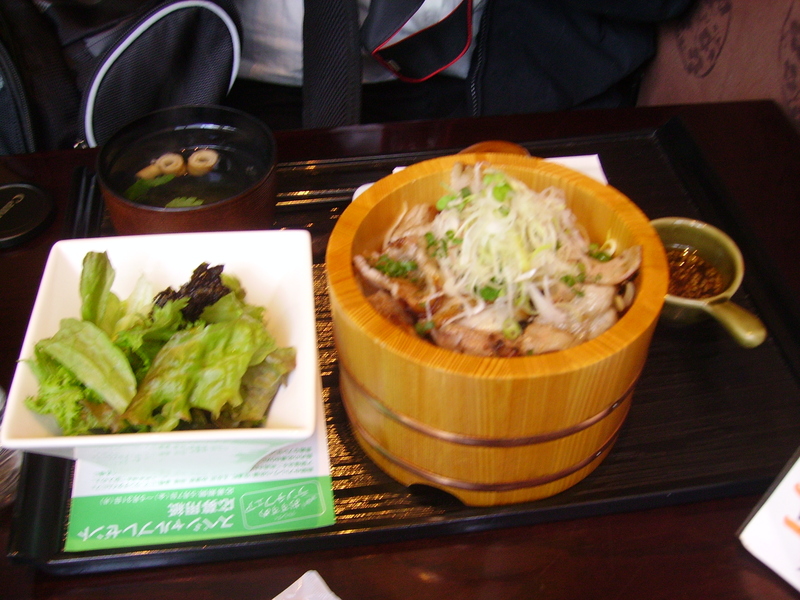 Bento boxes can hold a variety of different meals. I’ve seen some that have beef rice bowl (gyudon), pork cutlet with sauce (katsu), and many different varieties of cooked fish, seafood, or sushi. Some Japanese convenience stores have meal cards at the counter. For around 300-700 yen the clerk will cook you a meal of your choice detailed on the meal cards. With all the aforementioned information it’s hard to argue the usefulness of the Japanese convenience store. While here in Japan I can’t help but be jealous of the mobile technologies available to them through their keitai denwa (portable phones). I’ve seen all kinds of weird and cool gadgets attached to the cell phones here and I can’t help but wonder when America will catch up with some of the Japanese innovations. Having a digital camera attached to your cell phone is nothing new back in the United States, but having a cell phone built around a digital camera is new entirely. I’ve seen a cell phone with a rotatable screen that had a full size camera lens that took ten megapixel shots. To compare to America’s best, the i-phone only has a three megapixel camera. 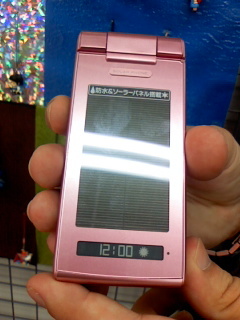 I’ve also seen cell phones with built in solar panels to help power users up while they’re on the go. Being stuck with a Tracfone back home I’m not certain if there are cell phones capable of streaming television shows in America, but in Japan streaming TV to your mobile phone is fast and smooth. On our recent visit to Future Scope and Lucent Pictures we were introduced to many 3-D translated movies, which are old movies that were re-mastered to use stereoscopic 3-D. I was skeptical about 3-D technologies and 3-D televisions but after the demo from Lucent Pictures I’m excited about the new wave of 3-D technologies. It’s surprisingly clearer with the newer technologies which shouldn’t shock anyone but I just never expected that the technology would have jumped as far as it did. What’s great about upcoming 3-D tech is the fact that it focuses more on depth rather than the dumb pop-out tricks of the past. This new focus is great for immersion into the movies or television shows because it feels more like watching the events through a window rather than a flat screen. With its new clarity, focus on depth, and old school 3-D pop-out tricks I can easily say that I’m excited instead of annoyed by the upcoming 3-D revolution. We went to DNP (Dai Nippon Printing) on May 13th where we were witness to some of the most advanced holographic, 3-D, and touch sensing technologies in the world. The exhibition that caught my eyes more than any of the others was a machine currently in use in Louvre according to our guides. It was a table capable of sensing objects placed on it and using them to build a 3-D display on a monitor that can be viewed from all angles, it was pretty cool. The more I think about the exhibit the more I get excited about other possible uses for it. One example is with current generation video games. Customization is presently popular in mainstream video games today and I believe the scan table (as I shall call it) could be beneficial to the current trend. Artistic players could customize their characters outside of the game using the method of their choice and use color objects for artistic touches. Otaku is the geek culture of Japan, its a world of people who obsess over things like anime and video games to the umpteenth degree. 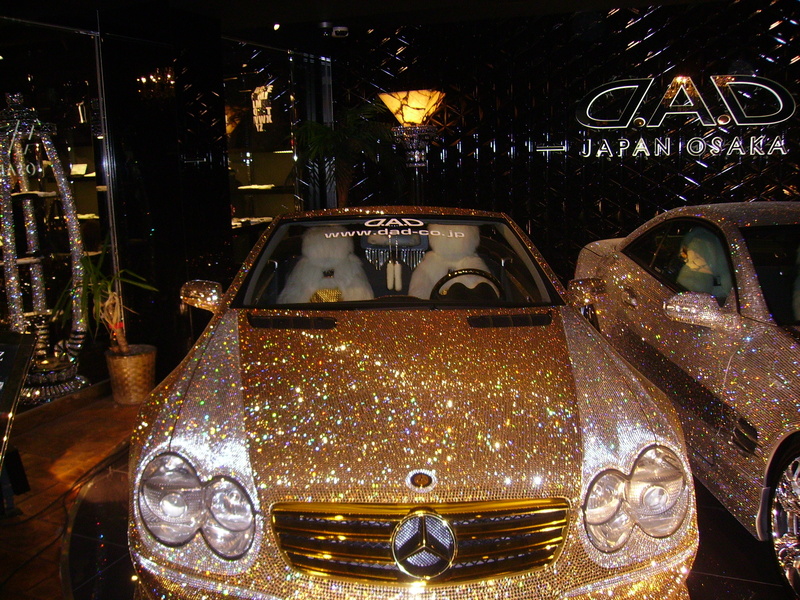 It’s a subculture that carries a bit of a negative image in the eyes of the Japanese mainstream culture. This negative image has lead to some tragic incidents like the Akihabara Massacre on June 8th 2008 where a man named Tomohiro Katō ran a truck through a crowd of otaku until it was inoperable. He then continued to attack people on foot with a dagger, in all ten people were injured and seven people died. Despite their negative image however the otaku culture has proved to be highly profitable to businesses that provide video games, manga, and anime to them, such as D3 Publishing. Personally I’m intrigued by the otaku sub-culture, being a bit of a geek myself it’s an interesting note that nerds/geeks aren’t just looked down upon in America. I just hope peoples’ misunderstanding of geeks doesn’t lead to an event similar to the Akihabara Massacre in the United States or anywhere for that matter. Otaku is the geek culture of Japan, its world of people who obsess over things like anime and video games to the umpteenth degree. It’s a subculture that carries a bit of a negative image in the eyes of the Japanese mainstream culture. This negative image has lead to some tragic incidents like the Akihabara Massacre on June 8th 2008 where a man named Tomohiro Katō ran a truck through a crowd of otaku until it was inoperable. He then continued to attack people on foot with a dagger, in all ten people were injured and seven people died. Despite their negative image however the otaku culture has proved to be highly profitable to businesses that provide video games, manga, and anime to them, such a D3 Publishing. Personally I’m intrigued by the otaku sub-culture, being a bit of a geek myself it’s an interesting note that nerds/geeks aren’t just looked down upon in America. I just hope peoples’ misunderstanding of geeks doesn’t lead to an event similar to the Akihabara Massacre in the United States or anywhere for that matter. Today we met with the vice president of D3 Publishing, a company involved in publishing manga, anime, and video games targeted towards the otaku (geek) crowd. One of their most recent games Dream C Club was published exclusively for the X-Box 360. The fact that D3 chose to support the X-Box 360 with its abysmal track record in Japan peaked my curiosity and I asked him why the 360 was a commercial failure in Japan. His first answer was because it’s not Sony or Nintendo something every outsider was thinking. All joking aside he informed me that one of the biggest weaknesses X-box 360 has going for it is the lack of brand saturation in the Japanese market. This is due to the laziness of Microsoft Japan and a lack luster or even non-existent marketing campaign. 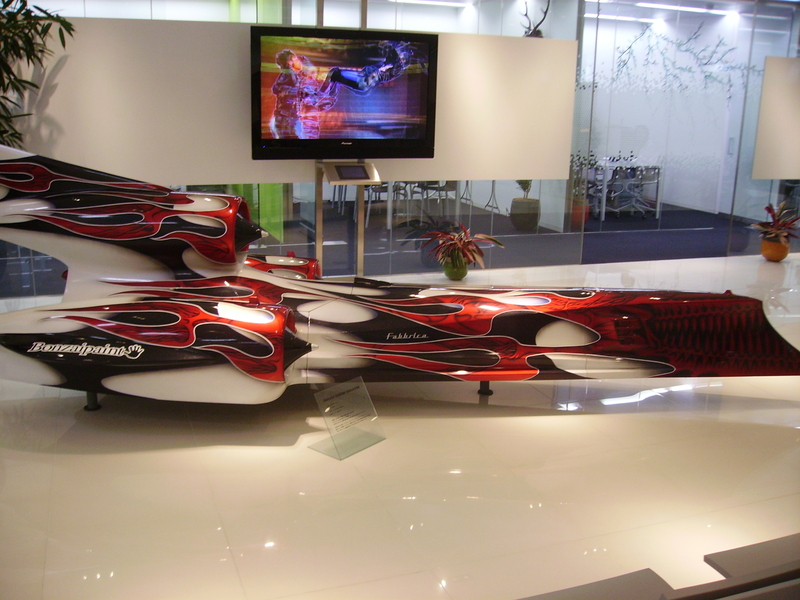 His answer was fascinating and a great lesson in the importance of a powerful advertising campaign and what it could do to help the X-Box 360’s success in Japan. 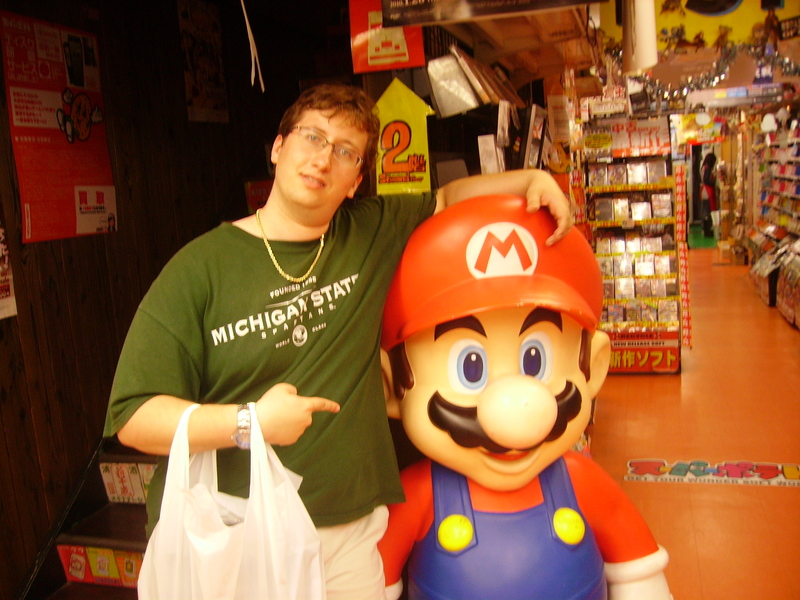 Greetings weary traveler welcome to Jared in Japan, a blog that holds the thoughts of one Jared Wilk as he traveled through a world of mystery and mind blowing mobile and electronic devices. Jared is also a studying game designer, check out his portfolio.